UNESCO Almaty Office will assist in accessing to information for sixty-four thousand women and sixty-five thousand men in thirteen remote villages in Kyrgyzstan. From April to October 2014, lawyers of Public Association "Partner Group Precedent" will train the local citizens in seven regions of the country according guarantees for accessing to information and using procedures for restoration of the rights. Series of two-day trainings will be held by representatives of community multimedia centers (CMCs), community radio, local government and seven categories of professionals (teachers, doctors, land and water users, businessmen, administrators). Seminars aimed at establishing effective cooperation between civil society activists and representatives of local government, by increasing the legal capacity of population in guaranteeing access to information held by public bodies and local authorities. In rural areas, Chui, Issyk - Kul, Talas, Naryn, Jalal- Abad, Osh and Batken regions where inhabited by 64,513 women and 65,370 men, access to information is transmitted primarily orally, people share information with each other, not always having an idea of ​​its regulation. Information is available by request only, classification of certain information is purely subjective and depends entirely on the individual. Interactive training method, based on the knowledge of the laws and its principles - will allow local governments and civil society activists to discuss common issues of local importance, to understand what information they are authorized to provide or classify what information should be published on a mandatory basis, ways to protect the violated rights. 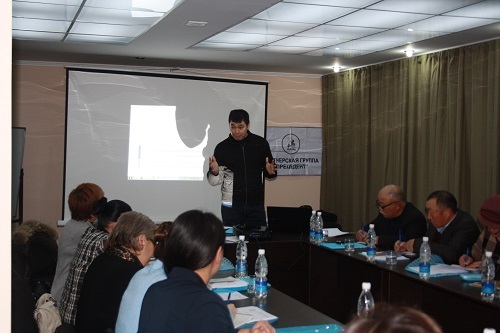 A series of trainings performed by Precedent Public Fund within the project “Operationalizing good governance for social justice in Kygyzstan” which was launched in October 2011 and is carried out within 36 months to October 2014. The project aims to increase the capacity to implement the just rights of citizens to public services, especially for vulnerable groups - women, youth and children in 30 rural municipalities in seven regions of Kyrgyzstan . This project is implemented by UNDP, UNESCO, UNICEF and UN Women. The European Union participates in the financing of this project, together with the above-mentioned UN agencies.